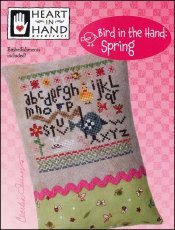 Bird In The Hand: Spring [G1567] - $8.50 : Yarn Tree, Your wholesale source for cross stitch supplies. Cross stitch pattern from Heart In Hand. What a cute design just in time for Spring! This design features a bird, chicken, butterflies, blooming flowers, a bunny, etc. The alphabet is stitched throughout the design. Flower embellishment is included. Stitch count 60w x 60h.